Gabriela Adamesteanu, The Encounter, Trans. by Alistair Ian Blyth, Dalkey Archive Press, 2016. Pushed around by ticket takers who demand his ticket in several languages, a middle aged man goes through a nightmare of hiding and getting away until he manages to cross a frontier guarded by soldiers and dogs. He’s made it back to his native village. There he finds his whole family gathered around a big table, as if for a wedding, a baptism or a wake, but no one recognizes him, not even his mother. Harassed by train conductors who demand his ticket in several languages, a middle‑aged man endures a nightmare of hiding and flight, before managing to cross a frontier guarded by soldiers and dogs. He has returned to his native village. There he finds his whole family gathered around a big table, as though for a wedding, baptism or wake, but no one recognises him, not even his mother. The relatives take him for a lunatic on the run from an asylum, or for a Securitate informer, and chase him away. Traian Manu, a renowned scientist in Italy, wakes up from this typical dream of exile in a car driven by his wife on the highway between Naples and Rome. In spite of his wife Christa’s opposition, Manu has agreed to visit his native country of Romania, at the insistence of a former colleague, Alexandru Stan, in spite of not having had any ties with the country since it became a Communist state. It is August 1986. Romania is still a Communist country, ruled by Nicolae Ceauşescu. Of German origin, Christa understands Manu’s nostalgia but warns him of the dangers lurking in any totalitarian regime. To persuade him, she tells him stories from her own childhood and adolescence during the Nazi dictatorship, about growing up with the feeling of being permanently watched, about the humiliation of being part of a collective that glorifies a dictator, and about how she lost her family members one by one. Manu’s trip to Romania is in fact the brainchild of collaboration between Alexandru Stan, a Romanian official, and the Securitate. The aim is for the communist regime to take advantage of Manu’s relations in the West. Manu is followed everywhere, his every move is recorded on tape and in reports by the spy team, which finally (and paradoxically) succeeds in making Manu trust only those people who are actually Securitate agents—to the exclusion of all the innocent people who had been waiting for him in good faith. All this evolves into a perverse plan to enlist the innocents as informers via a blackmail scheme. Among the innocents is Manu’s nephew, Daniel, who vainly hopes to be recognised as his uncle’s younger alter ego—a character important to the story on account of his incisive point of view. An exiled scientist returns home to a country that has forgotten him. Or has it? Odysseus wandered for years before arriving at Ithaca. Manu Traian has been away as long, having left his homeland before the Iron Curtain clanged shut. As this novel, the latest by the renowned Romanian writer Adamesteanu (Wasted Morning, 1983, etc. ), opens, he is dreaming fitfully of running a gauntlet of officials demanding documents he cannot produce, then making his way, finally, to a place where he is now a ghost. It is a dream he has often. His name contains that of the Roman emperor Trajan, who conquered Romania, just as other names are suggestive of other times, other stories. Now that he is actually homeward bound, it’s the Securitate that means to conquer him, though, by ringing him with traps; invited to speak at a university, he flatters himself to think that his fame might be preceding him, without pausing to consider that the academics are implicated in the police state, as is everyone else. His German-born wife sees the danger clearly (“She knows it is too late to turn back. But she cannot stop herself from trying”), but he does not; his nephew, Daniel (think lion’s den), is perhaps the only innocent, but even he, the Telemachus of a book that resounds with allusions to and quotations from The Odyssey, is suspect. Even though there are hints everywhere that the Ceausescu regime is on its last legs, the police are vigilant enough to keep fat dossiers on everyone, from exiles to librarians (“It’s no accident that his daughter is called Mihaela, he says that he gave her this name in memory and honor of the last king of the former bourgeois-landowning Romania”). Still, in the end they have nothing to pin on Traian, who bungles through somehow—which is no guarantee of a happy ending. Layered, nuanced, and deeply allusive; readers without a grounding in recent Balkans history may miss some of the clues. The meaning of the story is clear enough, though, even if parts are opaque. The Encounter opens with a terrifying scene: an unnamed man, addressed here in what can be called the "close second tense" is traveling on a train when he hears soldiers approaching: “You burst out of the apartment and break into a run, behind you, you hear the soldiers’ boots, your pajamas are unbuttoned and your half-shaven face is lathered in foam. At speed you bump into the walls and their shiny, smoky, dark windows... and the strange faces gaze at you tensely, you are running, running, running!" Can horrific psychic wounds from wartime ever really heal? Can one merely will oneself to forget? These are the major themes explored in this newly translated novel by Gabriela Adameșteanu. We become acquainted with Traian Manu, a Romanian scientist who defects to Italy after suffering heavy losses in the Second World War. Considered a deserter by the Ceaușescu regime, he is forbidden to return until a sudden invite in 1986 by a former peer (and now, unbeknownst to Manu, Communist Party informant) to give a lecture in Bucharest. Housed in the infamously bugged Intercontinental Hotel in Bucharest, Manu reverts to depressing wartime memories, which only renew his animosity toward his homeland. Manu’s German wife, Crista, grew up under the Hitler regime and suffered even more tragedies in the war and struggles to overcome nightmares and flashbacks. It’s been said that one measure of a talented writer is the ability to utilize different viewpoints in one’s fiction. Adameșteanu employs multiple narrators, tense, and voice to tell her story, thus requiring her reader to constantly readjust to these varying perspectives. We read through the lens of not only Traian and Crista but those of family, students, and bureaucrats. Unfortunately, in addition to the use of abrupt changes of narration and chronology, a section will occasionally arise where it is difficult to identify the speaker. One main hurdle still facing Crista is survivor’s guilt. Though the war has been over for four decades, Crista still regularly plies Manu with flashbacks and nightmares. He advises her that it is possible that the wounds of the past can heal, especially if one keeps them under wraps, as he does. Crista disagrees. In a further twist, Manu wonders if perhaps some healing and forgetting hasn’t already taken place with his wife but that she is resisting this, which ultimately leads one to wonder if peace can be made after such devastation. Comic relief can be found in the “copies” of party dossiers on Manu by various apparatchiks, showcasing the absurdity of Ceaușescu’s minions. They follow his every move during his visit. Yet again, as always, he finds himself on a speeding train and an official is approaching, demanding a ticket, identity papers, some proof of an existence that will be acceptable. A familiar sense of panic swells up: “The eyes of the people in the compartment are fixed on you: are they looking? Are they not looking?” None of it matters because it will come back to haunt him; the same old dream in all its variations, always the same fear. Whatever about the prevailing images of train carriages, the actual reality is even more confined. He is a passenger in a car being driven by a tense, angry woman, his wife, a woman preoccupied by her horrors, her guilt and a wartime past. It is a subtle prism of a novel that speeds along, much as the nightmare trains. The scene is constantly changing and Manu, the central character, is very passive, little more than a passenger. The surest key to grasping Adamesteanu’s several meanings rests in an image of shrouded mirrors. No one is really sure of anything, least of all how much time has passed or how the characters have changed. There is also Manu’s love of Homer’s Odyssey, his favourite poem and greatest comfort in life. Adamesteanu makes effective use of this in bringing Manu alive, as he is a quiet personality and far from being a man of action, although, ironically, he does preoccupy the authorities who provide much of the humour in a novel that shifts intriguingly – and unexpectedly – between personal tragedy and black comedy. Adamesteanu quotes this as an epigraph that also shapes the narrative. The Encounter was first published in Romania as recently as 2013 and Alistair Ian Blyth’s symphonic translation conveys the various tone shifts of the several narrative viewpoints engaged with piecing together the story as the novel balances the melancholic with the farcical. The mild-mannered professor is caught up in his thoughts, aware of his position in returning to his homeland: “ . . . I’m a foreign citizen, I enjoy the protection of my adopted country, and what’s more, my former colleague Alexandru Stan, who I mentioned, has a good deal of influence. And I can vouch for him: after all, we’ve known each other since the age of 20, since we went abroad to study . . .” Only Stan did return. This proves crucial. While Manu is at a remove from the world from which he came and is dominating not only the high-speed exchanges of the confused officials – one of whom waits until he is alone in his office so he can “put his feet up on the desk, like an American” – the members of his extended family offer their extremely contrasting versions of Manu’s personal history. For this, Adamesteanu, who enjoys playing voices and tone shifts, summons a chorus-like communal voice that contradicts every fact. This confusion proves curiously helpful in establishing a very real sense of a society in upheaval. The plight of young Daniel, a most perceptive onlooker whose future at the university is derailed following the death of one of his friends during a late-night party, has echoes of Nobel literature laureate Herta Müller’s far darker and more surreal The Land of Green Plums (1993; translated by Michael Hofmann). Adamesteanu possesses a lighter touch than Muller, her humour is more benign, yet still sufficiently barbed to make a point. Gabriela Adamesteanu, Wasted Morning: A Novel, Trans. by Patrick Camiller, Northwestern University Press, 2011. To say this was one of the best books I've read this year would be an understatement; this is certainly one of the best books I've ever. Wasted Morning is one of those wonderful novels that at first seem unprepossessing and yet soon have you glued into what is an immensely rich and detailed story. That it took so long to be translated into English is a crying shame - but then there are so many literary treasures awaiting translation from Romanian that it is hardly a surprise. 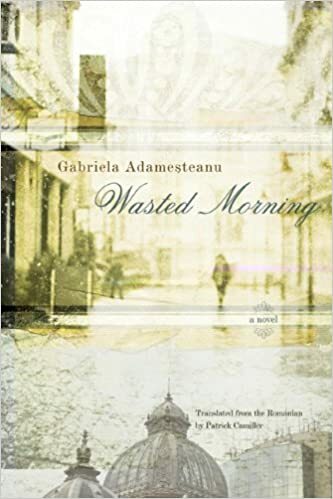 Gabriela Adamesteanu delivers what is, essentially, a family saga, that sees Bucharest and Romania traverse its troubled history. Making use of multiple narrative voices, the story is - while far from a 'feel good' or 'happy ending' - gripping and detailed. Gabriela Adamesteanu was born in 1942 in Targu Ocna, Romania. She has worked in literary and scientific publishing and has been the editor in chief of the magazine 22 since 1991. She is the president of the Romanian PEN Center. Her awards and honors include a 2002 Hellman Hammett Grant, administered by Human Rights Watch, and the 2004 Ziarul de Iasi National Award for Fiction, and she has also received grants for her translations from the French. She is the author of the novels Intalnirea [Meeting], Dimineata pierduta [Wasted Morning], and Drumul egal al fiecarei zile [The Equal Way of Every Day] and the short story collections Vara-primavara [Summer-Spring] and Daruieste-ti o zi de vacanta [Give Yourself a Holiday].